Guerillas Without Guns: LIKE A JOHN LE CARRE NOVEL: YUSH POISONED! As Ukraine hovered with the two Viktors (opposition leader Yushchenko and PM Yanukovych) running neck and neck for the presidency in the Halloween 2004 election, things got spooky. On the night of September 5, the opposition front-runner attended a small private dinner meeting with senior Ukrainian officials, including Ihor Smeshko, the head of the Security Service of Ukraine (SBU, successor to the Ukrainian KGB). The meeting was held at the cottage of Volodymyr Satsyuk, recently resigned from the SBU to focus on his other job in Parliament. Yushchenko brought along none of his security detail, and in the end he brought along only his campaign manager David Zhvania, who had arranged the meeting. Yushchenko later explained that, for whatever reasons, this dinner was the only time he did not take security measures to test his food. But Viktor's wife Kateryina, keen as she is, said that she tasted ‘a metallic-smelling medicine’ on her husband's lips after he returned home. Yushchenko went straight to bed and fell seriously ill by the next morning. He toughed it out for a few painful days before checking in at a private clinic on the 10th by which time the mysterious illness had reportedly caused severe internal problems and nerve paralysis on the left side of his face. As September wore on, his doctors were powerless to stop his face from erupting in a dense gray mask of Chloracne cysts. The results weren’t clear right away, but his doctors concluded he would live and should continue campaigning while they ran more tests. Yushchenko soon after his alleged poisoning. But even with this lack of evidence, the medical team finally decided on a “descriptive diagnosis,” not to be taken as conclusive, that Yushchenko had suffered from severe, intentional dioxin poisoning, reportedly the second-highest dose on record. Dioxins are a class of pervasive industrial pollutants, and everybody has some dioxin in their systems. But Dr. Zimpfer said tests showed Yushchenko’s blood samples contained more than 1,000 times the normal amount of TCDD, a particularly toxic form. These chemicals are not efficient killers; they cause cancer and predispose one to other ailments like diabetes – if they kill at all, it’s indirectly and after years. Only a few cases of acute poisoning are on record. One unsolved case from 1997 had five textile workers poisoned with a particularly strong isomer of dioxin; two fell gravely ill but neither died. This worst-case scenario happened, of all places, in Vienna - the very City Yushchenko would travel to for his diagnosis seven years later. The Ukrainian authorities of course denied the charge that they had been involved in any poisoning. There is “no logic in such an accusation,” said Taras Chornovyl, Yanukovych's campaign manager. Other supporters voiced their own concerns. Stepan Havrysh, a political ally of Yanukovych said that while he pitied Yushchenko in his plight, “I'm afraid, two weeks before the vote, it's all political technologies.” This is a term usually reserved for public relations and election strategies. 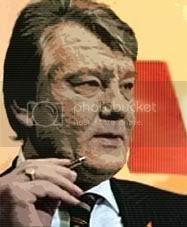 Others simply used the episode to taunt Yushchenko, speculating that his sudden disfigurement was from Herpes or some other disease a moral degenerate might pick up. Others have cited his long history with alcohol and food-triggered illness, and wondered if he didn’t drink too heavily and gorge himself on foods he knew would make him sick. Yet at the same time he wanted no immediate investigation into who poisoned him - and had hit-listed the entire parliament - until after the December election. “I don't want this factor to influence the election in some way – either as a plus or a minus,” he told the press. “This question will require a great deal of time and serious investigation. Let us do it after the election – today is not the moment.” The government’s investigation went ahead anyway, but a New York Times piece by C.J. Chivers from late 2004 noted “a chief obstacle has been Mr. Yushchenko himself, who has used the poisoning almost as a theme in his campaign, but has not fully cooperated with the authorities, even as the trail of his would-be assassin grows cold.” He was “busy with his campaign,” and besides, as campaign manager Zhvaniya explained, they had no faith that the official investigation would be anything other than a whitewash that would conceal the involvement of the authorities and their Russian backers. Jane’s Intelligence Digest summarized the downside of the episode for Moscow-Washington relations. When coupled with other, known, Russian involvement in Uraine’s politics, news of the poisoning was “likely to lead to a reassessment of Western foreign policy towards Putin's increasingly authoritarian Russia.” The Observer compared this bizarre cloak-and-dagger episode to the “Cold War world of a John le Carré novel.” For those unfamiliar, a John le Carré novel is a fiction, penned in the west, crafted to glamorize a great Anglo-American struggle against Russia. 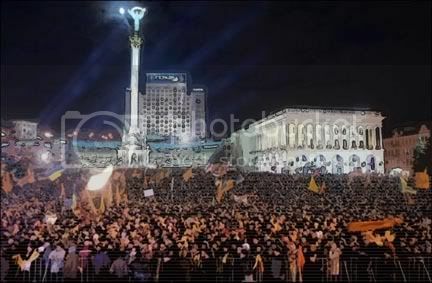 It should be taken as no small irony that Kuchma’s or Moscow’s alleged choice to try to poison the opposition leader into submission should have caused such a reverse effect, giving him a projected ten-point boost to 60% projected vote, according to one Ukrainian analyst, who summed up “if we suppose this was organized by the authorities, who wished to disfigure [Yushchenko], then they lost.” He survived the attempt, unembarrassed and just as ambitious as ever. “Everything is going well,” he told supporters, wrapped in an orange scarf as he returned to campaigning. “I plan to live for a long time and I plan to live happily. I am getting better health every day.” And soon, of course, he would be President of Ukraine. - Chivers, C.J. “A Dinner in Ukraine Made for Agatha Christie.” New York Times. December 20 2004.